Rendering the suffering of the marginalized visible has been an important aspect of feminist sociological studies of health, illness and medicine, with the subjective experience of those without access to institutional power being at the forefront of the research. This volume analyzes the links between the suffering caused by the intentional violence of war and the unintentional suffering engendered by modern medicinal processes. By establishing a fitting tribute to the academic and campaigning work of Meg Stacey, Global Perspectives on War, Gender and Health responds to her challenge of ’why medical sociology had not yet turned its gaze upon the health consequences of war’. A selection of international case studies are used to create a volume of significant interest to sociologists and those working in the fields of anthropology, social policy, social work, peace, war and security studies, and international development. 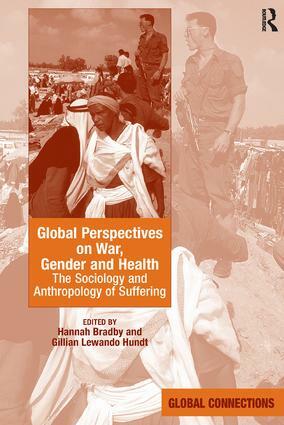 Dr Hannah Bradby (Department of Sociology) a medical sociologist and Professor Gillian Lewando Hundt an applied medical anthropologist (School of Health and Social Studies) work at the University of Warwick where they co-direct the Institute of Health.